The Australian Consumer Law Review Interim Report [PDF|DOCX] was released on 14 October 2016. Submissions to the Interim Report closed on 9 December 2016. More than 100 submissions were received in response to the Interim Report, including submissions marked as confidential. 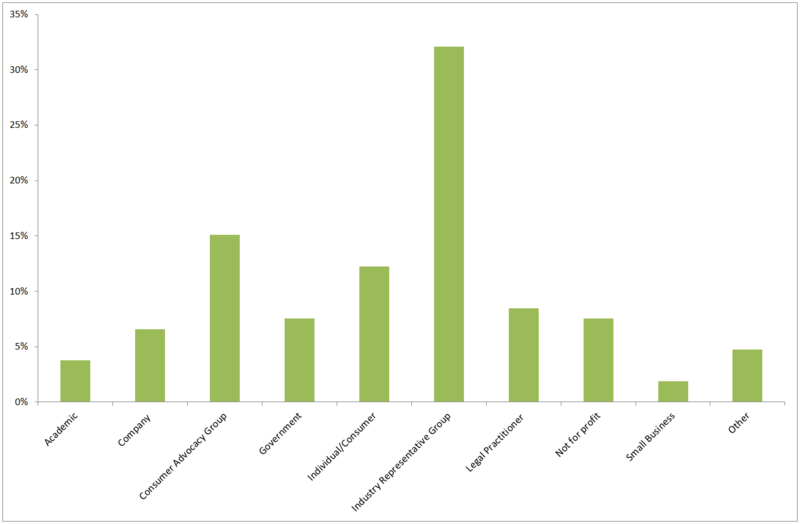 The chart below shows the breakdown of submissions received by organisation type (as a percentage). All non-confidential submissions are available below, listed alphabetically by stakeholder. The opinions expressed in the submissions are those of the authors and do not necessarily reflect the views of Consumer Affairs Australia and New Zealand or the ACL Review. If you are having difficulty with accessing any of the submissions below please contact ACLReview@treasury.gov.au.